Please note the WSIS Forum 2013 Programme Brochure is living document, it is essentially a compilation of session descriptions submitted to the WSIS Secretariat by the organizations responsible for their respective sessions at the Forum. ITU does not hold any responsibility for the session descriptions provided by the organizers of the sessions for WSIS Forum 2013. The WSIS Team at the ITU has provided session summaries for Organizations that were unable to submit their session summaries. All the session recordings are available on the webcast and agenda pages. The WSIS Forum 2013 was held from the 13-17 May 2013 at the ITU Headquarters in Geneva. This year the Forum attracted more than 1800 WSIS Stakeholders from more than 140 countries. Several high-level representatives of the wider WSIS Stakeholder community graced the Forum with more than 60 ministers and deputies, several ambassadors, CEOs and Civil Society leaders contributing passionately towards the programme of the Forum. 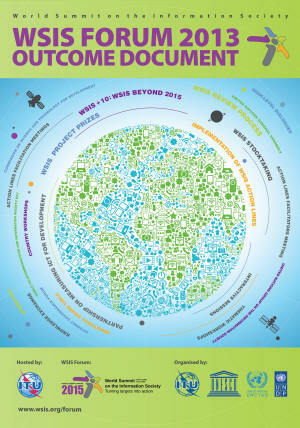 On –site participation increased tremendously during the WSIS Forum 2013. Several remote participants joined the forum through remote participation facilities. This annual gathering of WSIS Stakeholders, co-organised by ITU, UNESCO, UNCTAD and UNDP, provided the perfect opportunity for multistakeholder visioning and discussion on the WSIS process including the Overall Review of the Implementation of the WSIS Outcomes (WSIS+10). The presence of so many leaders here in Geneva, including over 50 ministers, was a sign, both of stakeholders’ commitment to the WSIS Process and of the important role ICTs will continue to play in tomorrow’s development agenda. WSIS+10 related sessions formed the WSIS+10 Visioning Track that was organized in accordance to the Plan of Action developed within the framework of the United Nations on the Information Society (UNGIS) Open Consultation Process on WSIS+10 (2011-2012, http://www.ungis.org). More than 150 sessions were held during the WSIS Forum 2013 in the form of high level dialogues, thematic and country workshops, showcasing theatres, ministerial round table, WSIS+10 Visioning Track, World Café style workshops, interactive sessions and action line facilitating sessions. This provided a vibrant atmosphere for facilitation and exchange on a multistakeholder vision of the WSIS Process. An exhibition space provided the perfect atmosphere to network, learn and share. The Outcome Document is available here. Please find below the outcomes of the sessions.